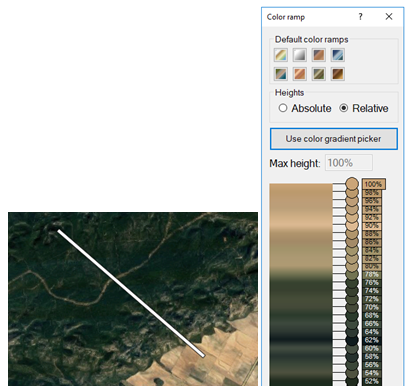 Instant Terra uses color ramps to convey elevation. The colors can be added, edited, and deleted in the node parameters. To add a Color Ramp node, right click in the Graph Editor and select Create Node > Color > Create color Ramp. Click on a preset color ramp to apply it. Absolute where different colors correspond to absolute heights, and you can specify the minimum and maximum heights. Relative where the different colors are expressed as a percentage of the minimum (0%) and maximum (100%) heights. 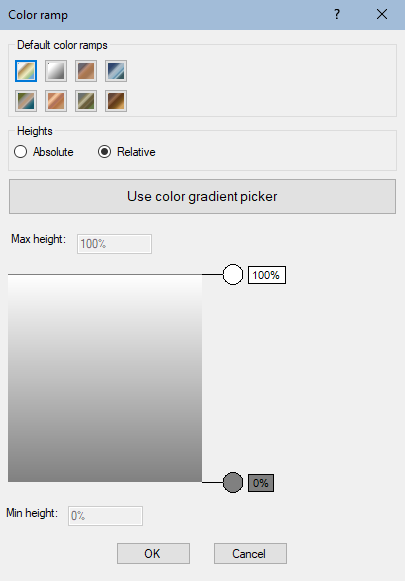 Add color using color dialog: Use the Color Picker dialog to select a color. The color appears as a circle the Color Ramp dialog where you clicked. Add color using color picker: Use the color picker to draw a segment anywhere on the screen, including outside the Instant Terra window. 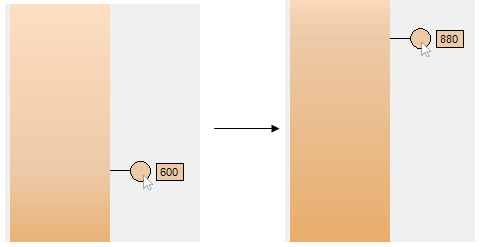 A color ramp is automatically created from the colors under the segment. Edit color using color dialog: Use the Color dialog to select a new color. Edit color using color picker: Use the color picker to select a new color. To modify the absolute or relative height of a color, left click and hold the mouse button down on the color circle, and then move the mouse up or down to a reposition the circle position. To remove a color, right click on the color ramp the you want to delete and select Remove. The color is removed from the color ramp. 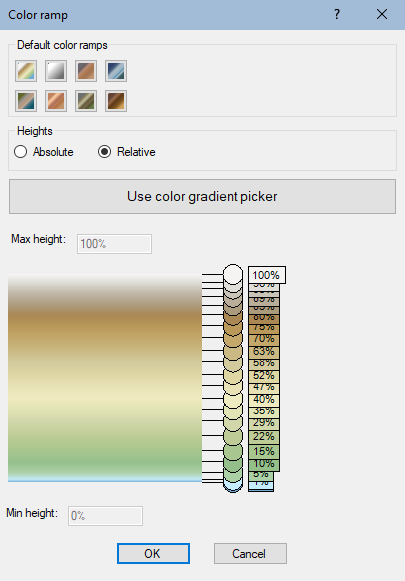 Initializes the current color ramp from the colors defined in the predefined color ramp. Absolute In this mode, the different colors correspond to absolute heights, and you can specify the minimum and maximum heights. Relative In this mode, the different colors correspond to heights relative to the minimum and maximum heights. Min value In Absolute mode, the height corresponding to the first color at the bottom of the ramp. Max value In Absolute mode, the height corresponding to the last color at the top of the ramp.